Verizon just announced a new promo that can land you up to 2GB of free data if you use Android Pay. It’s not straight forward, so let me try to explain this before you all go out and rush to Trader Joe’s to get in on the freebie action. According to Verizon, you can get 1GB of free data by tapping to pay with Android Pay in supported stores. 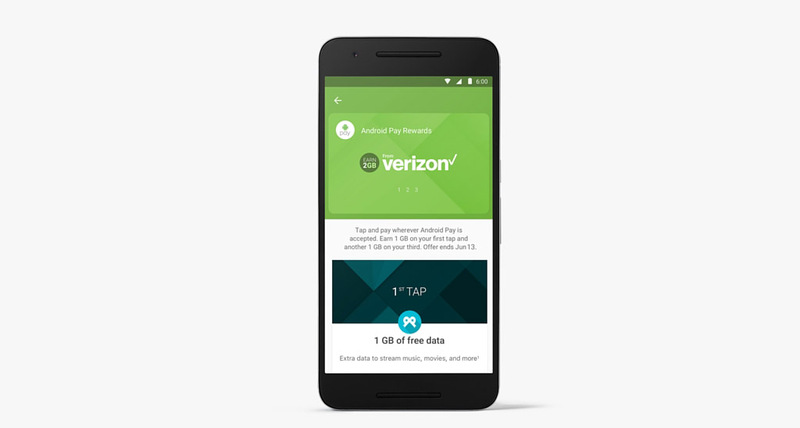 If you continue using Android Pay, Verizon will give you another free 1GB on the third tap. In other words, you need to use Android Pay three times in order to get 2GB of free data. With me so far? The 2GB of free data is good for two billing cycles, so this isn’t something you can stash away for years, nor is it an ongoing free 2GB. It’s a one-time promo where you can get up to 2GB to use within two billing cycles. Still with me? In the fine print of the promo, Verizon explains that the promotion is offered “only to Verizon postpaid consumer subscribers with The Verizon Plan or The MORE Everything Plan.” So you have to be involved in one of those tiers of plans, otherwise you shouldn’t waste your time looking for free data. The deal ends on 6/14/16 and you must redeem your 2GB by 7/13/16.